Adobe Presenter is a great option for creating SCORM-compliant eLearning material for a learning management system (LMS) using PowerPoint. You should, of course, follow all instructional design and adult learning principles, and be careful not to make your PowerPoint too wordy and un-interesting to your learners. Your course should be engaging and keep the interest of your learners. Using audio narration with Presenter is a great option available for those presentations that might need it. In this post, we will look at some of the various LMS publishing options available in Presenter. The Publish menu is located on the Adobe Presenter tab in PowerPoint. To publish your course, click the Publish button. Before you can publish, you need to set your SCORM settings. These are found under the Quiz button by selecting Manage. This can be misleading, as you always set your SCORM settings here, even if you don’t have an assessment included in your course. If you do have an assessment, Manage Quiz is where you add and edit your questions. However, once you are on the Quiz Manager page, selecting the Reporting tab takes you to the publishing and reporting options for the course. A little disclaimer: Each LMS differs in reporting and requirements. Check with your LMS administrator for the proper settings for your LMS. Select AICC or SCORM (depending on your LMS) under the Learning Management System (LMS) section. More on the Manifest in a bit. Set your Report Pass/Fail options in the Report Pass or Fail section – depending on if you want pass/fail or complete/incomplete to show on the LMS for the course. This connects back to the report data option you just selected. If you are using a quiz score, for example, you’ll want pass/fail. If you are reporting slide views only, then complete/incomplete will be your choice. You can also set the status to be based on the report data (in the Choose report data section). Select if you want to report a score or a percentage in the LMS. 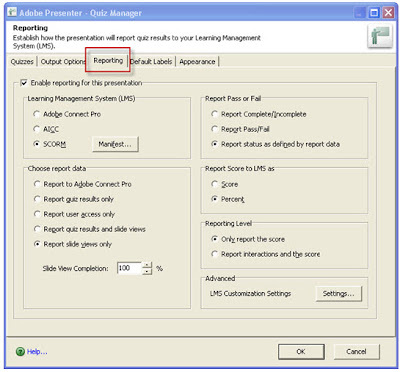 The Reporting Level area allows you the capability to show the score or the interactions and the score. This is dependent upon the LMS. Many, including Adobe Connect Pro, won’t be looking for the interactions level and will only report the score. When you select SCORM in the Learning Management System (LMS) section, you need to input the course information into the Manifest by selecting the Manifest button (see image below). This is the information that will be passed off to your LMS for display. 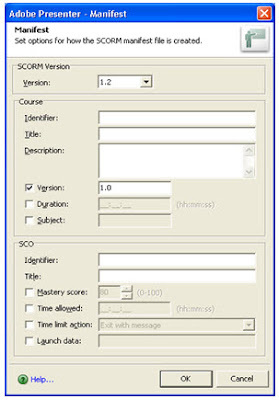 Select SCORM 1.2 or 2004, depending on your LMS. Add your identifier (usually something like a course code), the course title and description, and a version number if you are tracking versions. Your SCO identifier is used for the purpose of sharing content across courses, with an identifier and title for search ability. Check with your LMS administrator to see if this is needed. Once all of the information is set, you are ready to publish the course. Click Publish to open the dialog box (see image below). You can save the published files to your computer, Adobe Connect Pro or even a PDF file. 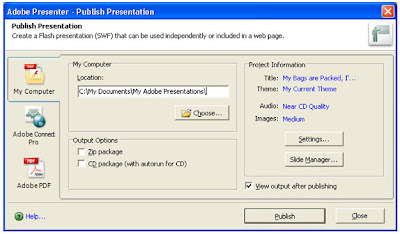 The default location is the “My Adobe Presentations” folder on your own PC, which you can change. Once you select the location for the project, the location remains the same every time you publish the project. It is still a good idea to double-check the location before you publish – especially if you sometimes publish to external drives. Under Output Options, check “Zip package” to create a zip file with all of the necessary files for incorporation into an LMS. The first time you publish, however, it is a good idea to keep that unchecked and ensure that “View output after publishing” Is checked. This opens the course automatically from the drive after you publish it so you can perform quality assurance before creating the zip file for LMS integration. When you’re ready, click the Publish button. That’s all there is to it. Any other tips or tricks for publishing in Presenter? Feel free to share them below!